Record high home values, stagnating incomes, the largest economic downturn in a century and record levels of student debt are just a few examples of the roadblocks between millennials and homeownership. All these factors have manifested in millennials’ inability to sock away enough cash in their savings accounts for a down payment and the historically low homeownership rates for their age group. And yet, many millennials in particular parts of the country are defying the economic trends and becoming homeowners. Below, we find out where millennials are buying homes. In order to rank the places where millennials are buying homes, we examined data on two factors. We looked at the current rate of millennial homeownership and also compared the change in the millennial homeownership rate from 10 years ago to the current rate. Check out our data and methodology below to see where we got our data and how we put it together to create our final rankings. Millennial homeownership down Across the 200 cities we analyzed, millennial homeownership is down 4.4% on average. Only 42 cities saw their millennial homeownership rate rise. 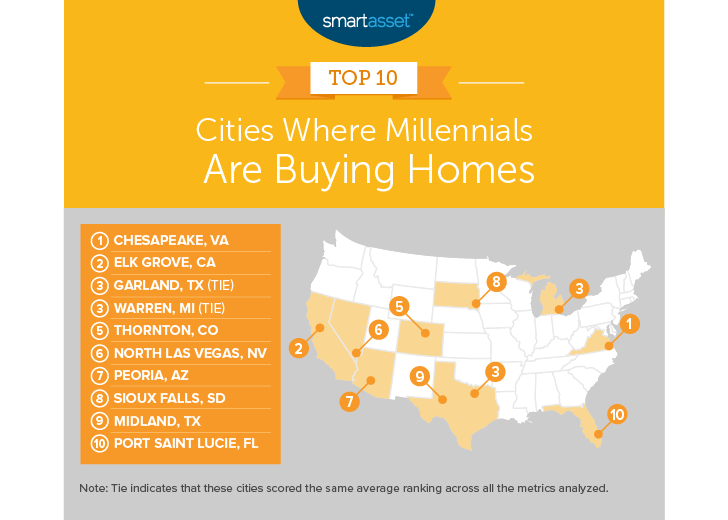 Home value alone is not a significant factor The top 25 cities where millennials are buying homes have an average median home value of $294,000. The 25 cities where millennials are not buying homes have an average median home value of $284,300. Chesapeake has the fourth-highest millennial homeownership rate (55.3%), according to our analysis of Census Bureau survey data. But beyond the high homeownership rate, Chesapeake ranks well because of how far millennials there have come in just 10 years. In 2008, the millennial homeownership rate was only 43.4%. That’s a difference of nearly 12%, the most in our study. Millennials in Elk Grove, a Sacramento suburb, have not had much trouble buying homes. In 2008, the millennial homeownership rate here was greater than 56%, and in 2017, that figure jumped to 63.3%. That gives Elk Grove the highest 2017 millennial homeownership rate in the study. Millennials in Garland can perhaps thank the relative affordability of their home city for their high homeownership rate. The median home in Garland costs just $161,700, second lowest in the top 10. Overall, the homeownership rate for millennials here has jumped from 33.4% to 42.2%, the fourth-largest increase in the study. Warren is another city where you can buy a house without too much capital. The median home in Warren is worth $124,700. That means to begin the purchasing process for the average home, you only need a down payment of $25,000. Overall, this city has a millennial homeownership rate of 46.6%, up from 41.3% in 2008. The housing market in Colorado is booming, and Colorado has some of the lowest property taxes in the nation. Millennials have done a good job buying homes here as well, according to Census Bureau data. Thornton has a millennial homeownership rate of nearly 57%, up from 54.65% in 2008. North Las Vegas, the most populated city in our top 10, has a millennial homeownership rate of nearly 48%. 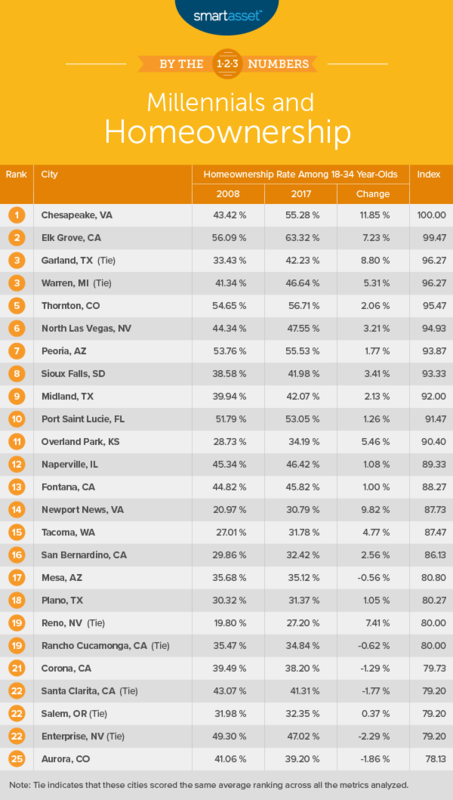 While that is a high figure, it is not a massive improvement on the 44% 2008 rate, which is why North Las Vegas only ranks sixth. The average effective property tax rate in Arizona is just 0.77%, and the average home in Peoria is worth $255,800, meaning if it was taxed at the average Arizona rate, annual property taxes would cost under $2,000. Perhaps enticed by the low property taxes, millennials have been buying here instead of renting. In 2017, nearly 56% of millennials in Peoria owned their homes. Just under 42% of millennials own their home in Sioux Falls. For that metric, Sioux Falls ranks 17th. From 2008 to 2017, the millennial homeownership rate here increased by 3.4%. While that may not seem like a large uptick, it is the 13th-largest increase recorded in our study. The median home in Sioux Falls costs less than $200,000 per year, so a large chunk of millennials should be able to come up with the funds to buy a home. Midland secured a top-10 spot on the back of two top-20 scores. This city has the 16th-highest millennial homeownership rate. From 2008 to 2017, the millennial homeownership increased by 2.13%, the 19th most in our study. The median home in Midland costs a little more than $200,000, making it more affordable than most cities, but fairly high property taxes in Texas make the long-term costs of homeownership slightly expensive. Port St. Lucie takes the final spot in the top 10. This city has long had a high millennial homeownership rate, which slightly hurts it in this study. While more than 53% of millennials here own their homes, that figure has roughly held steady since 2008. This city ranks sixth for 2017 millennial homeownership rate but 31st for 10-year change in the millennial homeownership rate. 2017 millennial homeownership rate. This is the percent of millennial households who own their homes. For this study, we defined millennials as those under the age of 35. 10-year change in under-35 homeownership rate. This is the percent change in the homeownership rate among 18-34-year-olds from 2008 to 2017. Data comes from the U.S. Census Bureau’s 2008 and 2017 1-Year American Community Surveys. To create our final score, we ranked each city in each metric. Then, we found each city’s average ranking and gave equal weighting to both metrics. Using this average ranking, we created our final score. The city with the best average ranking received a score of 100. The city with the worst average ranking received a score of 0. Don’t just look at home value Location can play just as important a role in whether or not you can afford to buy a home as your monthly mortgage. Due to property taxes, you may be able to afford a $500,000 home in Colorado but not in New Jersey. Make sure you have a good understanding of your annual housing costs before you start buying property. Get an expert’s opinion Any kind of investing can be risky, especially if you are buying something worth multiple years of your income. Instead of taking unnecessary risks, why not talk to a financial advisor? If you are not sure where to find the right financial advisor, check out SmartAsset’s financial advisor matching tool. It will match you with up to three local financial advisors who fit your investing needs. The post Where Are Millennials Buying Homes? 2019 Edition appeared first on SmartAsset Blog.